"I like convertible notebooks where the screen swivels to become a tablet. So kudos to Acer, Fujitsu, HP, and Toshiba. I also like the fingerprint readers for passwords on the Fujitsu, IBM, and MPC machines. And, of course, I need a reliable notebook. In our reader surveys, IBM and Apple come out on top." "In March (and a little earlier than I had budgeted for) I collected a new 12-inch Apple PowerBook, delivered with two 15-inch PowerBooks and a PowerPC to the Mahidol University International College (MUIC) out at Salaya, Thailand. I walked across campus from the Engineering Faculty, partly to save a second delivery trip, but really because I could hardly wait to get my paws on it. "With the PowerBook, I made a custom install: no un-needed languages; no IE; no trial version of MS Office; but I made sure X11 was installed so that I could run Unix software. The process took about 30 minutes, then came the user set-up." "Fujitsu is planning to sell 2.5-inch hard drives with a capacity of 200 GB in the first half of 2007, the company says. "The drives, intended for use in notebook PCs, will consist of two disk platters that will store up to 100 GB each, for a total of up to 200 GB. The largest capacity 2.5-inch drives the company currently sells store 120 GB, according to Fred Hirose, a spokesperson for Fujitsu." LONDON - "A television ad for an IBM laptop has been pulled after Apple geeks, notorious for their devotion to all things Apple, mobilised to complain that Big Blue was not the only company to offer 'Klutz proof wireless'. "The Ogilvy & Mather-created ad for IBM's ThinkPad had run for almost a year, during which it was the only computer to feature drop protection technology, or "Klutz proof wireless". "However, after Apple introduced the same technology in its PowerBooks at the end of January 2005 and the ad was aired in February, two viewers and Apple fans complained. They said the ad's strapline, 'Klutz Proof Wireless. Only on a ThinkPad', was misleading." PR: Other World Computing (OWC) and Newer Technology, Inc. are offering the longest lasting batteries available for 12" PowerBooks. NewerTech NuPower PowerBook and iBook batteries are designed, engineered, and assembled in the USA using only the best components. The result is a quality product that consistently outlasts the competition in terms of both operational runtime and useful longevity. Longer runtime means more time spent unplugged between charges. Better longevity means a longer useable life span compared to other available batteries. "The NewerTech NuPower design goes beyond just adding extra capacity," said Larry O'Connor, president of OWC. "The extra runtime is great, and that along with the long useful life span of NuPower batteries is what sets them apart from any other." NuPower's new 53.3 Watt Hour battery model is immediately available for $139.99, and provides more than 13% additional capacity over original Apple batteries and as much as 32.5% more capacity than other non-Apple after-market batteries. "First introduced only two years ago, today people recognize NewerTech's NuPower batteries for the quality and longevity they provide," O'Connor said. "For a very long time customers have been asking when we'll have our 12" Aluminum PowerBook Battery available. We are pleased to announce that time is now, and we are sure customers will find it worth the wait!" PR: Take your laptop to a new level of comfort. The LapBottom has a comfortably padded underside that grips your lap. We have made the underside thinner yet a bit more rigid and firmer with the same comfortable feel. This thinner profile makes the LapBottom more portable than ever before. The top combines raised ridges and non-slip "feet" to provide air flow under your laptop while holding it in place. It is made of light weight and durable materials. Measuring 12-1/4" x 9-1/2", it compresses to under an inch thick. The LapBottom now comes with three different size self adhesive "feet" which allow you to choose a variety of "tilts" or choose more or less air space under your laptop. 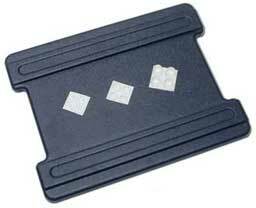 The new polyurethane "feet" are more durable and hold your laptop more firmly in place. PR: The Lapinator uses 3M's Type B Thinsulate insulation as the main barrier to the heat generated by laptop computers. The Lapinator employs Type B Thinsulate, typically used in footwear, which is pre-compressed and will never lose its ability to block the heat. The crosslinked molded foam bottom also acts as an insulator. We tested the Lapinator using a Dell Inspiron running on the Lapinator for an hour sitting on a wooden desk in a 70° room. The top of the Lapinator reached 125°, however, the temperature between the Lapinator's legs and the desk was a cool 73°! Only 3° of the extra 55° could make it past the Lapinator! As proven by The-Gadgeteer.com, the Lapinator keeps your laptop computer cooler too! In fact, it reduces the CPU temperature 11 degrees more than the same laptop running on a wooden desk. When a laptop runs on a desk, the wood or metal surface acts as a "heat sink." This is never more clearly evident than when using your laptop in your. It doesn't take long to realize that your legs also act as a heat sink. This heat conductivity creates a "hot spot" right under your laptop that makes it much more difficult for your laptop's cooling system to work efficiently. Buy two or more Lapinators and get 20% off your order. PR: iScroll2 is a modified trackpad driver that adds two-finger scrolling capabilities to supported pre-2005 PowerBooks and iBooks on OS X 10.3. Supported models include aluminum PowerBooks introduced from 2003 to 2004 as well as all G4 iBooks. The installer will tell you whether your machine is supported or not. Note that both the driver and this check may not work if you have another alternative trackpad driver (such as SideTrack or FingaMIDI) installed. As of version 0.20, iScroll2 includes preliminary Tiger support. To enable scrolling mode, just place two fingers on your trackpad instead of one. Both fingers need to be placed next to each other horizontally (not vertically, the trackpad cannot detect that). Some people get better results with their finger spaced a little bit apart, while others prefer having the fingers right next to each other. For linear scrolling, move the two fingers up/down or left/right in a straight line, respectively, to scroll in that direction. Circular scrolling works in a way similar to the iPod's scroll wheel: Move the two fingers in a circle to scroll up or down, depending on whether you move in a clockwise or counterclockwise direction. In addition to scrolling, iScroll2 also supports mapping the trackpad button and the tap gesture to a specific mouse button. The trackpad button can also be remapped dynamically depending on whether two fingers are on the trackpad. This can be configured in the included preference pane. Warning: iScroll2 has not yet been thoroughly tested on Tiger. If you encounter any issues, please provide feedback so I can work on resolving them. reverted to using the controls present in the Keyboard & Mouse pref pane. Warning: As in version 0.18, this will cause problems on OS X versions prior to 10.3.8. If you are still using an older version, please consider upgrading or using iScroll2 0.19. Warning: Because of changes in the pref pane, only its English version is included in this release. The other localizations will be re-added once they have been updated. PR: SideTrack is a replacement driver for most PowerBook and iBook trackpads. With SideTrack installed your standard trackpad becomes a powerful multi-button scrolling mouse. SideTrack 1.1.2 does not support the new trackpad hardware found in the January 2005 PowerBooks. Support for the new trackpad will appear in the next major release of SideTrack. PR: ThermoInDock shows the CPU's junction temperature in the Dock. It also supports the modules to change the style of Dock icon. The current version of ThermoInDock won't work on some models of Power Macs and PowerBooks due to lack of thermal sensor on their CPUs. New in this version: Fixed a bug where ThermoInDock won't work on Mac OS X 10.4.